When checking diamond quality or any of the Four Cs, you may come across terms that are puzzling. What, for example, has a diamond got to do with a table? Isn’t ‘crown’ where a diamond belongs rather than a specification? 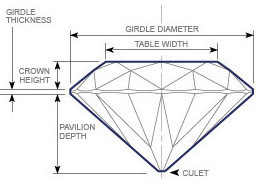 What on earth does a diamond have to do with a ‘pavilion’ or a ‘girdle’? Here’s an easy-to-understand guide on what all those bewildering terms mean. When you are familiar with the terminology that describes the various parts of a diamond, you can avoid common cutting flaws, such as a thicker girdle, a sloping table, or too few facets, or a poor cut. All these flaws affect the reflection of light from the diamond and the overall appearance of the stone. The cut and shape of each diamond requires different proportions for the best appearance. If you have decided on the shape you want, be sure to investigate the specific dimensions, called ‘ideal proportions’, for that shape.